Definition at line 47 of file llheadrotmotion.h. Definition at line 78 of file llheadrotmotion.cpp. Definition at line 92 of file llheadrotmotion.cpp. Definition at line 64 of file llheadrotmotion.h. Definition at line 89 of file llheadrotmotion.h. Definition at line 75 of file llheadrotmotion.h. Definition at line 78 of file llheadrotmotion.h. Definition at line 81 of file llheadrotmotion.h. Definition at line 72 of file llheadrotmotion.h. Definition at line 84 of file llheadrotmotion.h. Definition at line 87 of file llheadrotmotion.h. Definition at line 171 of file llheadrotmotion.cpp. Definition at line 261 of file llheadrotmotion.cpp. Definition at line 99 of file llheadrotmotion.cpp. References LLMotion::addJointState(), LLJointState::getJoint(), LLCharacter::getJoint(), LLMotion::getName(), llendl, llinfos, LLQuaternion::loadIdentity(), mCharacter, mHeadJoint, mHeadState, mLastHeadRot, mNeckState, mPelvisJoint, mRootJoint, mTorsoJoint, mTorsoState, LLJointState::ROT, LLJointState::setJoint(), LLJointState::setUsage(), LLMotion::STATUS_FAILURE, and LLMotion::STATUS_SUCCESS. Definition at line 180 of file llheadrotmotion.cpp. 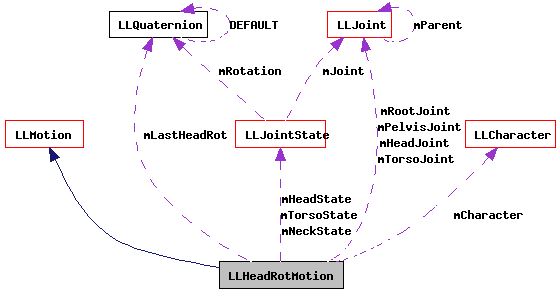 References LLQuaternion::constrain(), LLQuaternion::DEFAULT, f, LLCharacter::getAnimationData(), LLCriticalDamp::getInterpolant(), LLJointState::getJoint(), LLJoint::getParent(), LLJointState::getRotation(), LLJoint::getWorldRotation(), HEAD_LOOKAT_LAG_HALF_LIFE, HEAD_ROTATION_CONSTRAINT, left, lerp(), mCharacter, mHeadState, MIN_HEAD_LOOKAT_DISTANCE, mLastHeadRot, mNeckState, mPelvisJoint, mRootJoint, mTorsoState, NECK_LAG, nlerp(), LLVector3::normVec(), LLJointState::setRotation(), TORSO_LAG, TORSO_LOOKAT_LAG_HALF_LIFE, TRUE, and VZ. Definition at line 113 of file llheadrotmotion.h. Definition at line 116 of file llheadrotmotion.h. Definition at line 122 of file llheadrotmotion.h. Definition at line 124 of file llheadrotmotion.h. Definition at line 121 of file llheadrotmotion.h. Definition at line 118 of file llheadrotmotion.h. Definition at line 117 of file llheadrotmotion.h. Definition at line 115 of file llheadrotmotion.h. Definition at line 120 of file llheadrotmotion.h.